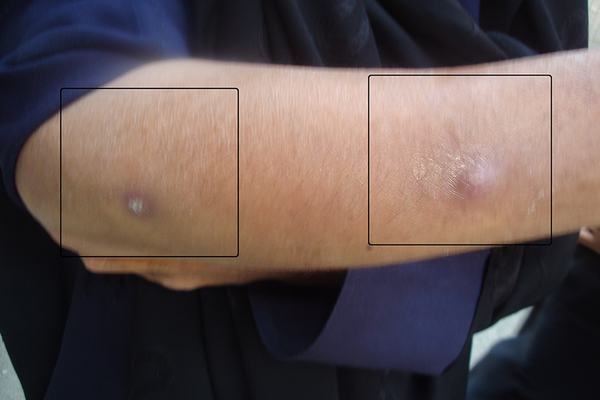 To Cite: Rasolinejad M, Salehi M R, Pargar A. Multi Lobulated Soft Tissue Tuberculosis Abscess in the Forearm of a Rheumatoid Arthritis Patient: A Case Report, Arch Clin Infect Dis. 2015 ; 10(4):e20035. doi: 10.5812/archcid.20035. Introduction: Tuberculosis is a chronic bacterial infection that is caused by Mycobacterium tuberculosis. This chronic infection is amongst important of reasons for morbidity and mortality in the world. Cutaneous tuberculosis is a rare form of extra pulmonary involvement. Case Presentation: The case was a 42-year-old female, a known case of rheumatoid arthritis that was receiving prednisolone, and presented multi-lobulated soft tissue abscess in the forearm. Smear of the drained pus had 3+ Acid Fast Bacilli (AFB) and culture of the drained material confirmed Mycobacterium tuberculosis. Conclusions: The detection of Mycobacterium tuberculosis is always an important differential diagnosis for skin and soft tissue involvement in endemic areas. The cold abscess is an uncommon form of cutaneous tuberculosis that can be single or multiple and with or without fistula. Tuberculosis is a chronic bacterial infection caused by Mycobacterium tuberculosis. This chronic infection is among important causes of morbidity and mortality in the world (1). Tuberculosis incidence is equal in males and females. Advancements in tuberculosis treatment have decreased the incidence of tuberculosis yet the infection is still a major health concern worldwide (2, 3). The prevalence of the disease has increased with growth of immunosuppressive patient’s population (especially AIDS patients) in the recent decades (1, 4, 5). Lungs are the most common sites of tuberculosis involvement yet other extra pulmonary organs can be infected as well (1, 2, 4, 6). Cutaneous tuberculosis is a rare form of extra-pulmonary involvement (5, 7). Clinical presentation of different types of cutaneous tuberculosis varies and is determined by factors such as route of infection and cellular immune status of the host (8). Cold abscesses are one of the cutaneous and soft tissue involvements. Tuberculosis cold abscesses usually occur in immunosuppressive patients (1, 5). 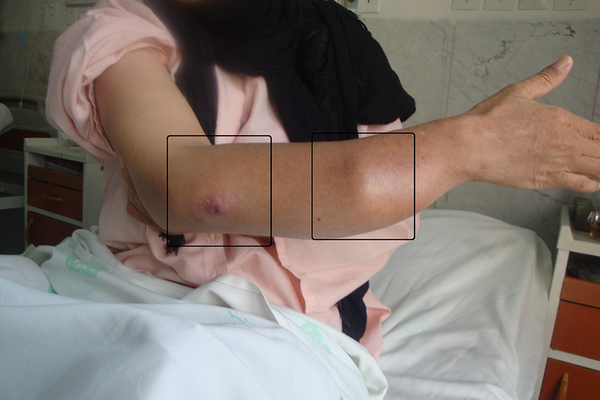 The case was a 42-year-old female, who was a known case of rheumatoid arthritis for many years and was admitted to Imam Khomieni hospital (Tehran, Iran) during the year 2012 with intermittent fever, pain and swelling of the right forearm and elbow for the previous six months. She had been having a fistula on the lateral aspect of her right forearm with little discharge for the past six months. She had taken prednisolone (15 mg/daily) for the last four years. The patient had received several courses of antibiotics from different classes without any improvement. The protocol of this study is in compliance with the ethical board guidelines of Tehran university of medical sciences. Consent was signed by the patient before treatment. Physical examination revealed, low grade fever (the oral temperature was 38°C), mild redness, warmth, tenderness and swelling along the lateral side of the right forearm. There was also fluctuation and fistula over that area (Figure 1). The remainder of the examinations was normal. Laboratory studies revealed, white blood count (WBC): 7100, Erythrocyte Sedimentation Rate (ESR): 90, tuberculin skin test: 15 mm and radiographs of the chest was normal. Right forearm Magnetic Resonance Imaging (MRI) showed two large lobulated longitudinal fluid collections at the dorsolateral aspect of the forearm (about 8.5 × 5 × 3 cm at the elbow joint and 3 × 1.5 × 7 cm at the distal third forearm) that were drained by needle aspiration (Figure 2). The drained fluid was yellow pus. Smear of the pus had 3+ Acid Fast Bacilli (AFB) and culture of the drained material confirmed Mycobacterium Tuberculosis. Anti-tuberculosis agents (Isoniazid, Rifampin, Ethambutol and Pyrazinamide) were initiated and abscesses were drained by needle aspiration. The soft tissue infection completely improved after two months of treatment. All the above diagnostic and therapeutic measures had been done after obtaining the consent of the patients. The diagnostic clues of extra pulmonary tuberculosis include: chronic lymph adenopathy, pleural effusion and thickening, chronic monoarthritis and spondylodiscitis being a child, and having an immunosuppressive disease (HIV+) (5, 6, 9). Diagnosis is routinely difficult and elusive (4). Lymph nodes, pleura, pericardium, central neural system, urinary and musculoskeletal system and skin are the most common sites of extra pulmonary tuberculosis (1, 2, 4, 6). Skin and soft tissue involvement is a rare form of Mycobacterium tuberculosis infections (1% - 2%) (5, 7). However, detection of Mycobacterium tuberculosis is always an important part of differential diagnosis of skin and soft tissue involvement in endemic areas (9). Cutaneous tuberculosis arises from cutaneous mycobacterium inoculation, contiguous transmission from bone, joint and synovial infection and in very rare cases by the hematogenous route, and overall it seems that cutaneous tuberculosis without bone involvement is uncommon (5-7, 9). Cold abscess is an uncommon form of cutaneous tuberculosis that can be single or multiple and with or without fistula. These abscesses are usually multi-lobulated and occur in immunocompromised patients (1, 5). In addition, cold abscesses do not involve toxic symptoms and cause minimum inflammation (10). Mycobacterium tuberculosis can easily involve surrounded soft tissue of infected bone or joint and produce cold abscess, yet some of these abscesses have been reported without any bone or joint involvement (10). Sometimes tuberculosis abscesses are mistaken with tumors (11). Tuberculosis should be considered in differential diagnosis of cold abscesses, especially in immunosuppressive patients (5). 1. Laboratory methods: smear, culture and PCR of drained material (12). 2. Imaging methods: sonography, Computerize Tomography (CT) scan and MRI (method of choice) (2, 4, 5, 8). Aspiration of the abscess and laboratory examination is usually adequate for diagnosis confirmation (9). These abscesses are not distinguishable from pyogenic abscesses in imaging methods (1). In MRI, the abscess was indicated by a hypo signal in T1 and hyper signal in T2 and not enhanced with gadolinium while the abscess wall was enhanced. 3. Surgical procedure required for other reasons (4, 5). Response to treatment is based on the improvement of clinical manifestations, resolving of the abscess on imaging studies and decrease of ESR (2). Treatment regimens for pulmonary and extra pulmonary tuberculosis do not differ (4). This report presented a rheumatoid arthritis patient with a forearm tuberculosis cold abscess. Immunosuppression in the context of corticosteroid use was an important risk factor for this patient. Drainage (without CT guidance) associated with standard anti-tuberculosis regimen was very effective for this patient. In conclusion, it is necessary for clinicians to consider tuberculosis in immunosuppressive patients with abscesses. Authors’ Contributions: This manuscript was written by Afsaneh Pargar, Mohammad Reza Salehi and Mehrnaz Rasolinejad.